Two weeks after the recent measles outbreak spread to Lakewood, news of additional cases have sent hundreds scrambling to receive vaccinations and school administrators working to ensure that those in their charge will not be compromised by the highly contagious virus. The scourge, which originated with visitors from Israel, has spread throughout Orthodox communities in the New York area over the past month, with more than 30 reported cases. Doctors and clinics around the town have set up arrangements to accommodate the large numbers of people who have sought to receive immunizations. The CHEMED clinic, which has administered 800 shots over the last two weeks, for the duration of this week is administering the MMR (measles, mumps, rubella) vaccine on a walk-in basis for anyone seeking to receive the shot. Doctors’ offices, and other health-care providers, too, have been inundated by the increase in demand for vaccinations. The drive to ensure that vaccinations are up-to-date has been driven not only by heightened awareness of the dangers of the virus, but by a decision by many schools to take a stricter approach to ensuring that students’ vaccination records are up-to-date. Yeshivah Ketanah was one of many mosdos that had determined that, in light of the official Health Department declaration of an outbreak, no students who were not immunized could be in the building for the time being. A spokesman for the Igud Hamosdos who requested anonymity told Hamodia that some 15 schools had sent any unvaccinated children home in accordance with guidance from Lakewood’s renowned pediatrician Dr. Reuven Shanik, CHEMED and other health authorities. According to reports, some schools have had to request that up to 20 children remain at home until the epidemic dies down. Many others have given parents until the end of the week to get their vaccination records up to date. The spokesman said that most of the families he had dealt with had failed to immunize as a matter of “laziness,” but that for the time being he was holding off contacting those in his mosad who submitted “religious exemptions” not to vaccinate. Other schools have taken a “wait and see” approach. Rabbi Yisroel Schenkolewski, director of Bais Kaila and long-time askan, told Hamodia that upon consultation with Rabbanim, they had decided not to send any students home for the time being. “The Health Department hasn’t given any regulations, but if anyone would come down with [measles] they let us know that they would come down and quarantine anyone who they think was exposed,” he said. Measles is one of the most contagious viruses in the world. If an infected person walks into a room, the virus can remain for two hours after the person leaves. According to the World Health Organization, 15 people die every hour worldwide from measles. The virus can be particularly dangerous to those suffering from illnesses that decrease their immunity, as well as to expectant mothers. Infected people develop fever symptoms and a rash that can take weeks to show up, but they can transmit the virus to others before that. Given the ease with which the dangerous virus can be transmitted, many businesses and some shuls in Lakewood have requested that unvaccinated individuals stay out of their premises as well, until the outbreak has been declared over. The present outbreak began when a visitor from Israel who was in New Square over Sukkos was diagnosed with the virus. Israel is currently in the midst of a large-scale outbreak, with more than 1,300 diagnosed cases. Since October, the scourge has spread to several Orthodox communities, including Boro Park, Williamsburg, and Monsey, and more than 30 cases confirmed. Two weeks ago, a single case was confirmed in Lakewood, and since then four more have been reported, but according to CHEMED, there are several more suspected cases in the town as well. In light of the airborne nature of the illness, health-care centers have asked those who suspect they may have measles to call before coming for treatment, and have set up separate facilities to deal with possible cases without exposing others. CHEMED set up a tent in its large parking lot for screening and treatment of suspected measles cases. Since the wide introduction of the MMR vaccine several decades ago, measles has been a rarity in the United States. According to the Centers for Disease Control and Prevention (CDC), 90 percent of unvaccinated people who come in contact with the virus will become infected. While it is possible for vaccinated people to contract measles if exposed, the rate is only three percent. 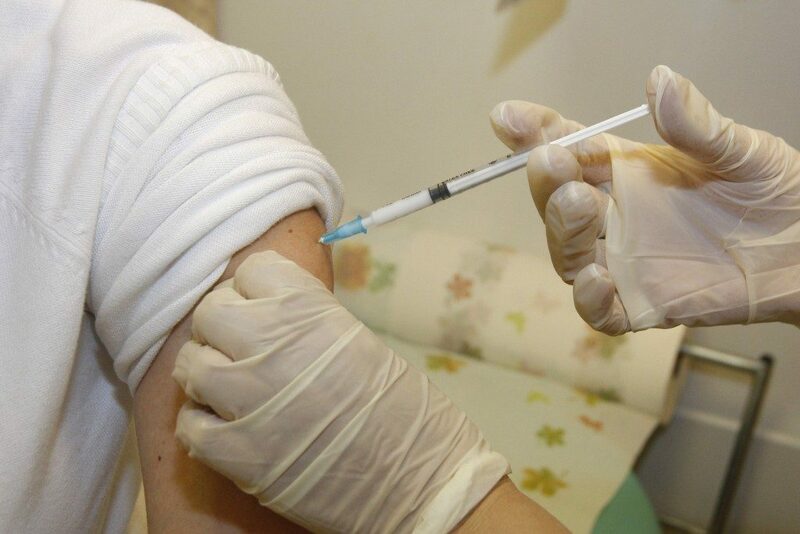 Students are required by law to receive the two-dose MMR vaccination before entering school, but parents can claim a “religious exemption.” The exemption, however, does not entitle the child to remain in school if the county health department declares an official outbreak, which was done in Ocean County last week. Privately operated schools have the legal right to accept only vaccinated students, a policy which many mosdos have implemented. “Everybody is entitled to ask their own she’eilos what to do about immunizations, but if we had a security risk in the school we would rightly be expected to do what we have to to keep our students safe. This is no different,” said Rabbi Lederer.